With Shaykh Mohammad Ilyas (Darul Ihsaan Academy, ASCC). *Full course fee will be REFUNDED upon complete course attendance & minimum 75% pass mark of end exam. 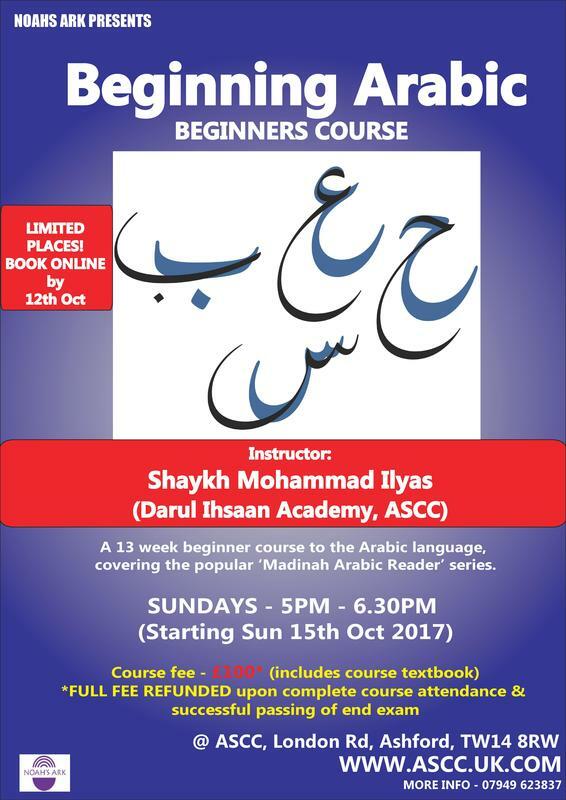 A uniquely incentive-driven beginners Arabic course covering the popular Madinah Arabic Reader series. Shaykh Mohammad Ilyas completed the memorized the Holy Qur'an at the age of 12. He initiated his Islamic studies at the renowned Jamiah Islamiah Talimuddin Dabhel in India. During his time studying in India, he was blessed to study and learn the science Qira'ah with one leading Qurrah of our age, Qari Mohammed Siddiq Falahi (Falah Daarain, Tarkeshwar, India). Shaykh further consolidated he studies by finally travelling to Egypt to study at the illustrious Al-Azhar University, where his studied Arabic and Shafi' Fiqh briefly. Upon his return to the UK, Shaykh Ilyas started up Darul Ihsaan Academy in the West London area with hundreds of student studying weekdays and weekend. This course assumes that the participant has knowledge of the Arabic alphabet and is able to recite from the mushaf at a minimum. 1. Click here and donate £100 by clicking the 'Donate Now' button.